The Federal High Court in Lagos on Monday ordered the temporary forfeiture of a 12-storey building at 27 Marine Road, Apapa, belonging to Senator Peter Nwaoboshi (PDP-Delta North Senatorial District), until the conclusion of investigations. 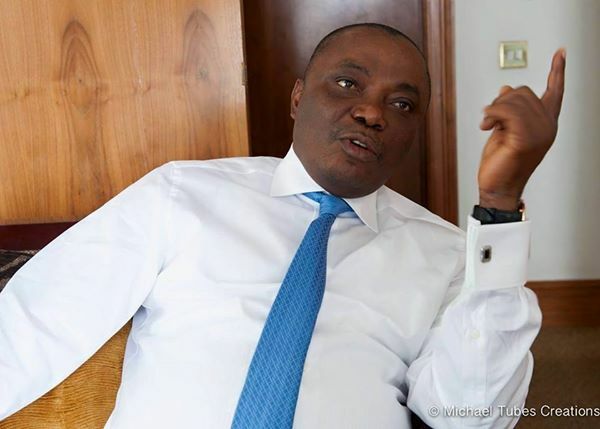 The order followed an application by the Economic and Financial Crimes Commission (EFCC) and argued by its counsel, George Chia-yakua, against Senator Nwaoboshi and his two companies: Golden Touch Construction Project Limited, and Bilderberg Enterprises Limited. Nigeria, 1999 (as amended), and Sections 28 and 29 of the EFCC (Establishment) Act 2004. He further told the court that the commission had received a petition from the anti-corruption group, 'Anti-Corruption and Integrity Forum', against the senator and his companies, alleging money-laundering against the Senator, who is the chairman of the Senate Committee on Niger Delta Affairs. The deponent stated that sometime in 2010, the Tender Boards of Delta State awarded a contract to the Senator's second company, Bilderberg Enterprises Limited, to purchase new construction equipment for the Delta State Direct Labour Agency, for N1.580 billion. But rather than buying new equipment, the company only imported and supplied used equipment to the agency, although the state government fully paid for new ones. Mr. Abubakar further stated that the investigation revealed that the Senator moved the proceeds to various accounts linked to him, and his company bided and bought the said 12-storey building known as "Guinea House" in Apapa for N805 million, with the used of his first company, Golden Touch Construction Project Limited, adding that response from the Secretary of Delta State government shows the sale of the building was to the Senator's company. He further stated that in the assets declaration form submitted the Code of Conduct Bureau in June 2015, Senator Nwaoboshi claimed he acquired the said property Apapa through being a Director of Golden Touch Construction Projects Limited, a claim that was contradicted by the Corporate Affairs Commission, which revealed that the Senator is neither a shareholder nor a director of the company. Similarly, Nwanbuoku Ike and Emma Ekpon, the purported directors and shareholders, in their judicial statements denied knowledge of being directors and shareholders of the company, affirming that the presence of their names in the CAC documents was forged. The deponent also averred that further investigation revealed that the Senator's Bank Verification Number (BVN) 22300559079, has 20 Bank accounts he operates in Nigeria, while his private companies through BVN 22244303840, have 23 Bank accounts. Mr. Abubakar also further that he was informed on April 6, 2017, by E. E. Iheanancho, an EFCC lawyer, on that an order of the court attaching the said 12-storey building to the Commission to prevent its disposal pending the conclusion of the investigation and when a criminal charge will be filed against Senator Nwaoboshi and his companies. Justice Abdulaziz Anka, after listening to the EFCC counsel, ordered that the property at 27 Marine Road, Apapa, belonging to Senator Nwaoboshi, be temporarily forfeited to the federal government.